Rice Kheer is a cuisine from India usually served during a meal or as a dessert. It is better known as "Rice Pudding" all over the world. It is mostly prepared during the celebration time or festivals however as it is an easy recipe to prepare it can be cooked any day at your home. 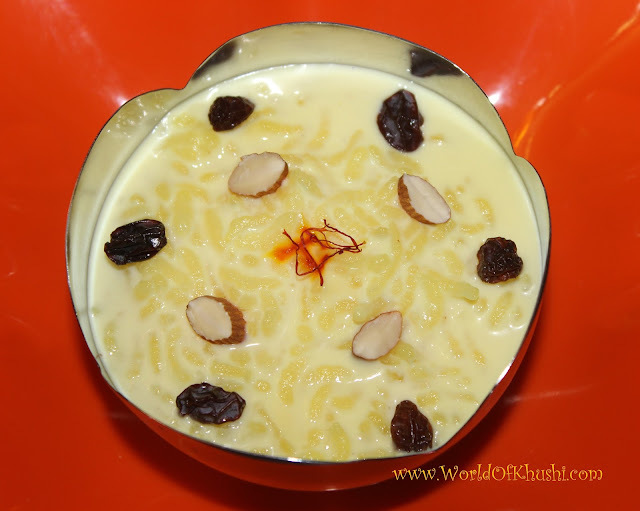 I have given the traditional Rice Kheer little of my style so you might see some ingredients which you will be new. However those are optional & you can definitely add your own touch also as I always recommend everyone to experiment & learn in cooking. 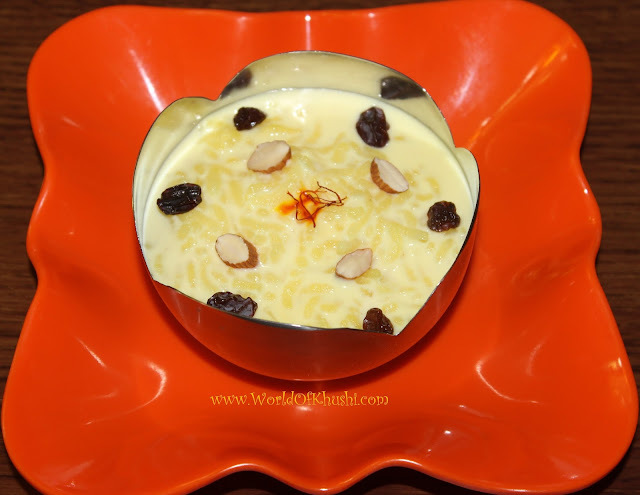 Thus let's celebrate today with this Rice Kheer. As it is an easy recipe, everyone can cook it at home. Step 1. Wash & soak the rice in 1 cup of water for 15 minutes. Step 2. After 15 mins drain the water & keep the rice apart. You can use small rice but I personally like basmati rice. Step 3. Start boiling the Milk. Step 4. Once it comes to a boiling point, reduce the flame & continue to cook until milk achieves desired consistency. Step 5. Add Saffron, Sugar & soaked Rice. Stirring consistently prevents the milk from getting a burning taste. Step 6. Cook for about 10 minutes. Add Condensed Milk, Cardamom Powder & Dry-fruits . Step 7. Cook for 2 more mins & your Kheer is ready. Step 8. Garnish with Dry-fruits. Note :- I am using Condensed Milk to thicken up the consistency of milk because here I am not able to find rich creamy milk. But if you don't want to use condensed milk you can use rich thick milk. I hope you guys like this recipe. Do try & enjoy with your family members. For more tasty recipes stay connected to Khushi's World.